Infection is caused by the spore-forming bacterium Paenibacillus larvae. This disease can result in severe colony losses. It affects only the brood, is highly contagious and extremely difficult to eradicate. The bacterial spores can remain viable for up to 60 years and are extremely resistant to heat extremes and chemicals. Infected larvae die and a distinctive foul smell develops upon decomposition. At this stage the remains can be drawn out as a string (i.e. extend up to 10-30mm). There after the remains dry out to dark and highly infectious foulbrood scales that remain in the cell. 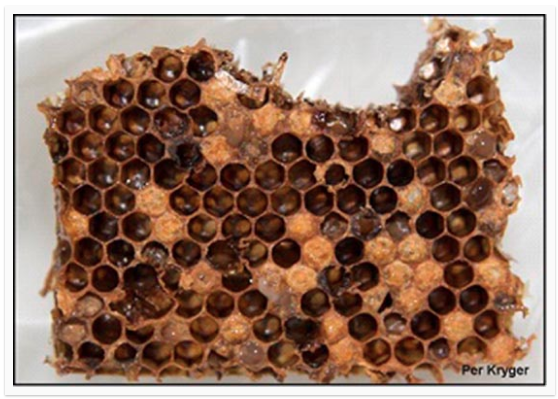 Infected colonies have scattered and uneven brood patterns with dark, greasy looking, sunken cappings.